A one-day symposium on "Internet of Things (IoT)", conducted by R.V.R & J.C College of Engineering, on 24th August, 2016 for faculty and students. A one-day conference on "4th Industrial Revolution - Internet of Things (IoT)" conducted by Govt. of Andhra Pradesh on the occasion of Krishna Pushkaralu 2016 on 23rd August, 2016. for students. A one-day workshop on "Entrepreneurship Orientation Programme" conducted by NSIC, on 29th July, 2016, for third year B.Tech., MBA and MCA Students. Central Vigilance Commissions(CVC) on the Occasion of Vigilance Awareness week from 26 – 30 October 2015”,a Debate Event Competetion on topic “Role Of Youth in Eradication Of Corruption”,conducted by SBH, Arundelpet Branch,organized by EMDC of RVR & JC college of Engineering, on 30th October 2015 for B.Tech.,MS & CA students. A three-day certification workshop on "Entrepreneurship Awareness Programme",conducted by Ministry of Micro, Small & Medium Enterprises (MSME), organized by EMDC of RVR & JC college of Engineering, during 21 -23 September, 2015 for III year B.Tech., MCA and MS students. A one-day workshop on "Entrepreneurship Orientation Programme" conducted by NSIC, organized by EMDC of RVR & JC college of Engineering, on 30th July, 2015 for third year B.Tech., MBA and MCA Students. A one-day workshop on "Entrepreneurship Motivation Programme" organized by EMDC of RVR & JC college of Engineering, on 15th July , 2015 for III year B.Tech., MCA and MS students. A one-day workshop on "Capital Market and Stock Market Functioning" conducted by the Garrison Institute of Finance, on 10th March, 2015 for MBA students. A workshop on "Enterpreneurship Orientation Programme" conducted by NSIC, organized by EMDC of RVR & JC College of Engineering, on 30th and 31st August, 2014 for final year students. 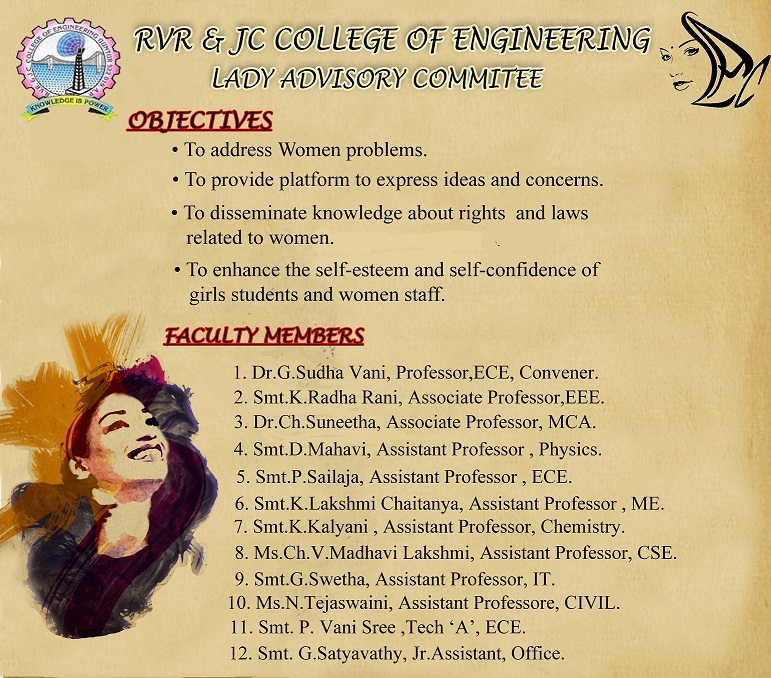 EMDC of R.V.R. & J.C. College of Engineering is organizing a four week duration Business Skill Development Programme(BSDP) for the Final Year B.Tech students of different branches during the months of November/December/January every year since 2005. This programme is organized by Micro Small & Medium Enterprises (MSME), Government of India. Of these programmes, BSDP was organized in 2009 exclusively for Budding Women Entrepreneurs. "Industrial Motivation Campaign" - Entrepreneurship Awareness Programme held on 11th January, 2012. "Industrial Motivation Campaign" - Entrepreneurship Awareness Programme held on 17th & 18th December, 2010. "Industrial Motivation Campaign" - Entrepreneurship Awareness Programme held on 21st November, 2009. Meet Inspiring Entrepreneurs - Entrepreneurship Awareness Programme held on 22nd November, 2008. "Industrial Motivation Campaign" - Entrepreneurship Awareness Programme held on 12th December, 2008. "Industrial Motivation Campaign" - Entrepreneurship Awareness Programme held on 7th December, 2007. Meet Inspiring Entrepreneurs - Entrepreneurship Awareness Programme held on 16th December, 2006. "Industrial Motivation Campaign" - Entrepreneurship Awareness Programme held on 10th November, 2006. "Industrial Motivation Campaign" - Entrepreneurship Awareness Programme held on 21st December, 2005. The EMDC was inaugurated by The then District Collector on 18th February, 2005 and a series of Technical Sessions were held for two days i.e., on 18.02.2005 & 19.02.2005 by eminent people like Sri M.Gopalkrishna, IAS (Retd); Chairman, APSFC, Hyderabad & Prof.S.Subramonia Sarma, Indian School of Business, Hyderabad etc,.